What do you do if your coffee maker totally bites the dust? This frugal-meister improvises with what's on hand: one carafe, one funnel, paper coffee filters, and a kettle to boil water. 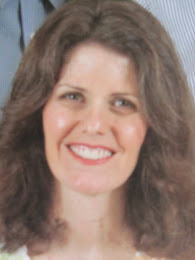 When undertaking any improvisational technique, there are drawbacks, like time, effort and maybe some clumsiness. But the pluses of improvising, like this, can be very compelling. And this is just how I've been making my coffee, lately. First obstacle -- getting the filter to tuck neatly into the funnel. 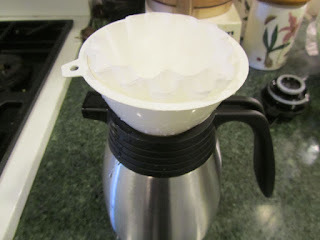 Cone-style coffee filters are more expensive than basket-style. But cone-style is what fits, best, in the funnel. So, I make my own cone-style out of a basket-style, with just a couple of quick folds. 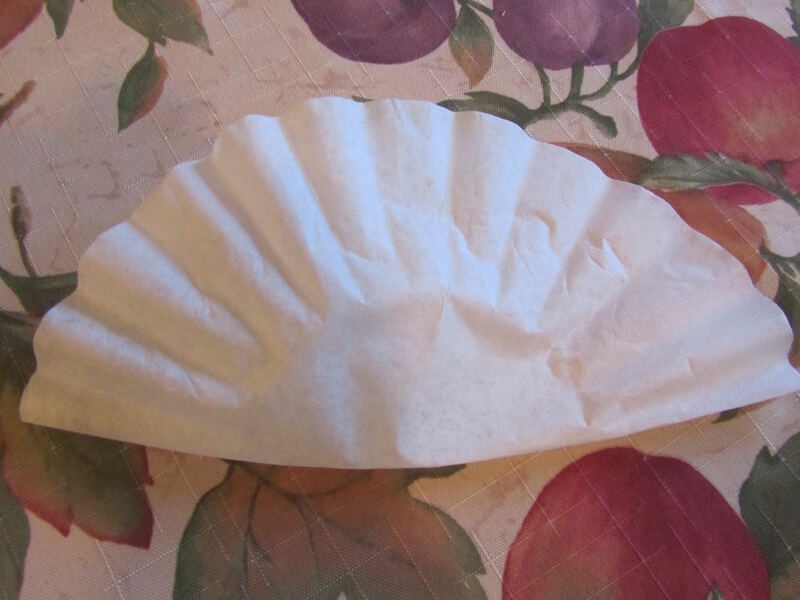 I flatten the coffee filter into a circle. 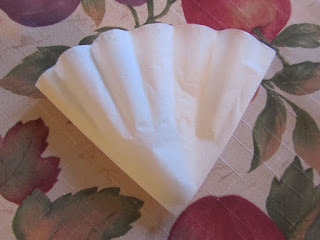 Then fold the filter in half, and then half again, creating a wedge shape. The folded filter now fits in the funnel, point down. I put both the funnel and filter into the mouth of an insulated carafe (a mason jar or thermos also works). The cone-shaped filter has 2 "pockets" which can hold grounds. I fill one of these filter-pockets with coffee grounds. When my kettle of water comes to a boil, I slowly pour it over the coffee grounds that are in the paper filter, and allow to drip through. Voila, one pot of coffee. I share this because you never know when you could be without your coffee maker, like there's a power outage and your electric coffee maker doesn't work, or, you're camping or picnicking, or, you don't have a working coffee maker (remember those college days with minimal kitchen equipment?). As long as you can boil water, you can make your morning brew. Now it's your turn to share. How or what have you improvised, using what you have on hand? Doesn't it make you feel awesome when you can cobble together a substitute for a piece of equipment, a tool, or appliance that you've grown accustomed to using? Good save! Thanks for the tip. Never know when it will come in handy. Those permanent filters are really nice. Our little coffee maker had one, but it wasn't the heavier mesh, but a fabric screen-type filter. It did tear eventually, but did last for over 20 years. Great idea . 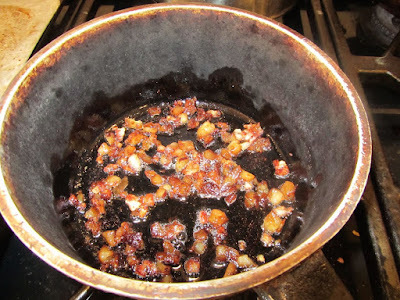 My brother in law always makes his coffee on the stove by boiling coffee in the pot (grounds and water ) after it boils for a few minutes he adds a little cold water and turns the burner off. After sitting a few minutes it's ready to drink . I drink it this way at their house but prefer other ways as this one you occasionly get a ground or two in your mouth . He calls this cowboy coffee. Their coffee maker broke years ago and they never replaced it . Your brother's cowboy coffee reminds me of the old-style percolators, that sat on the stove burner. I sometimes see them in vintage stores. But I like how flexible your brother's method is. You could make a very large kettle of coffee for a crowd his way. Hope your day is off to a lovely start, Dee! Wow, I'm impressed with your invention! I got a French press at a rummage sale for $3 and thought that would make a great back-up for coffee making. I do improvise here and there with things like this, but nothing is coming to mind. 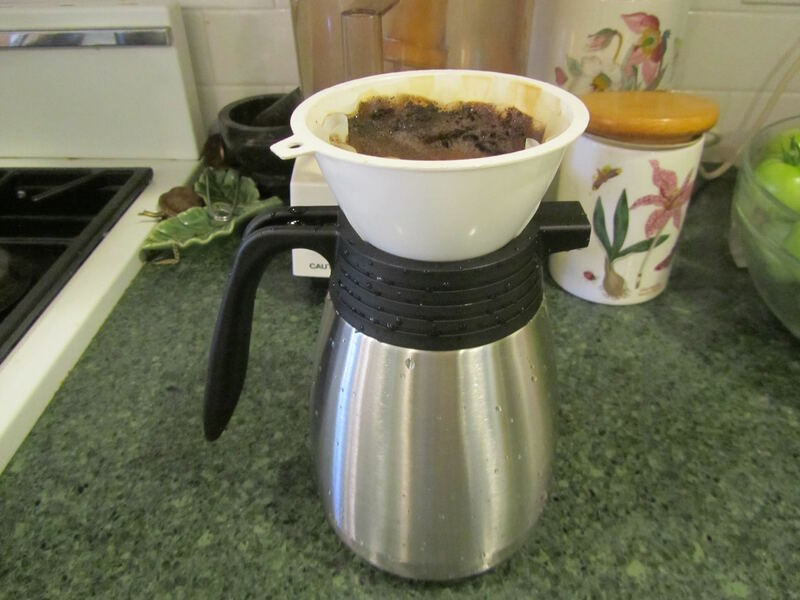 When I was in college, we made coffee with a plastic filter holder, by Melitta (I think they still sell them). We set the filter holder over a mason jar and poured the boiled water over the grounds manually. That's what gave me the idea. And using the thermal carafe keeps my coffee piping hot for hours. I've never used a French press before. But they do sound like a great back-up for a power outage, camping or picnicking. I bought the Militta just this last Christmas because we were without power for a long and cold couple of days. We also use it for that one or two cups of coffee without using the big coffee maker. I have a Bunn and I love it and also a percolator and now the Melitta! Love my coffee! I remember you telling us about your power outage, last winter. That must have been miserable! I'm glad you have a Melitta, now. Thanks for this idea as it will be nice to have coffee in a long power outage!! On the subject of coffee, I find that our Keurig is saving us money on coffee grains and filter because we can use less grains per cup the way we make it. Of course most people would not stretch their coffee grains like we do. We don't freeze old grains and reuse, but I may try that one day. Also keurig allows us to use only the amount of coffee grains precisely when we want to drink our cup of coffee. I make my husband's large cup and a half with about a tablespoon and a half of grains, then I add just a teaspoon to the used grains for my cup and a half of coffee. I don't particularly like strong coffees whereas he does, so this works for us, so almost 2 tablespoons for 3 cups. We do this 2x every morning, so a total of 6 cups (4T grains). When we made drip coffee, we always had extra in the pot which we threw away (we weren't as thrifty as today). I think we would measure about 8 to 10 T per pot, so we are using about half the grains every morning. I'm trying to think of an improvisation but nothing comes to mind, right now...I hope I have at least one to share. I have only had a Keurig cup of coffee twice. Both times I thought the coffee quality was quite good. So I'm guessing you use the refillable cups. The pre-filled ones sound pricey. I think what matters is that you have found the method that makes the coffee that you like, and that is affordable for you. In our house, we save leftover coffee and microwave it the next morning. We're pretty easy to please in that way. I've frozen coffee before, too. Have a great day, yourself, YHF! You are very on trend with your pour over coffee. My daughter got me a pour over,at a very good price. It is a metal filter that sits in a devise that holds it up over a coffee cup.We do not drink coffee very often anymore. Maybe once a month. this also works for tea as it is just a metal filter. I also have a french press and a electric coffee pot. I prefer the pour over. You come up with some great ideas. On the rare occasion I have a coffee at Starbuck's, I order a pour over decaf. I think the quality of a pour over individual coffee is quite good. I've never tried this with tea, but may give it a try. Thank you! All good ideas on how to make coffee. However, coffee is one thing I've never been into. I heard something once that spoke to me. "When they can make a cup of coffee to taste as good as the beans smell, I'll start drinking it." I love the smell of coffee beans but can take or leave the coffee. And it's easier and cheaper to just leave it. Also, my husband decaffinated himself a couple of years ago, and he only occasionally drinks coffee. I can understand. Coffee beans really do smell wonderful. One of my daughters doesn't drink coffee but she says the smell is quite good. Can I ask, do you have a beverage that you drink every morning? My sister and brother don't drink coffee, but drink Diet Coke every morning. And I have a good friend who drinks tea in the morning. I've thought about trying tea, first thing. I may give that a shot, if I need to cut back on coffee. I don't have much of a routine with a morning drink like tea or coffee. I try to have a glass of water or very dilute juice when I wake up to start my hydration for the day. Drinking enough is hard for me, so this is a good way to start. Oh good for you, live and learn! I really need to work at getting in more liquids, myself. Ha! Great job with your improv system! I'm always intrigued by reading posts about coffee because other than me, there are very few coffee drinkers in my life - it was my Ex who really got me into the habit. Anyhow, I've never owned a coffee maker - I just use a Melitta single cup system - which is basically like a fancy funnel except it has much smaller holes at the bottom. I think the idea is to keep the water in contact with the grounds longer? Anyhow, your filter system sounds intriguing - I'll have to price compare and see if they'll fit in my single cup cone. I agree on coffee needing to drain through the grounds slowly. I think the way this filter sits in the funnel actually causes the water to drip through slowly. 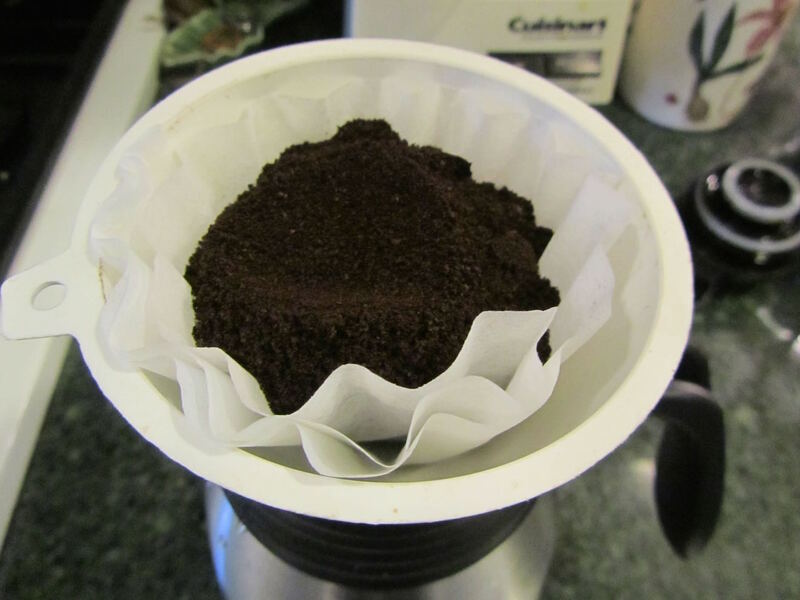 Because my filter folds make a point at the end where it sits in the funnel, part of the filter, filled with grounds gets "dragged" by its weight, down into the spout. And I think that slows the water flowing through. And also, the amount of grounds will slow it's drip, too. And since I make a liter at a time, I am using several tablespoons of grounds at a time. Anyhow, it works well for me, and makes a pretty decent (read "bold") pot of coffee. I buy my filters at Dollar Tree, 150 for $1. If you're buying Melitta filters, I'm pretty sure the Dollar Tree ones would be a fraction of the price. I was buying single cup Melitta filters a while back for our 1 cup at a time coffee maker, and the tiny box of 40 filters was a couple of dollars. Check out that post. It will show you how making your own cone filter from a basket one gets you the exact same size as Melitta size 1 cone filters.